Hennessy X.O is blended from more than 100 eaux-de-vie specially selected from the four first growing areas. 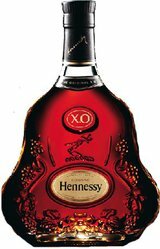 Rich, full-bodied and complex, Hennessy X.O combines the spicy aromas of oak and leather with the sweeter essences of flowers and ripe fruit. Well-balanced, the initial flourish is dominated by the powerful suggestion of pepper and rancio, which testify to the long years it has spent being aged. Complex and long-lasting.